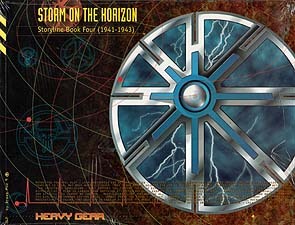 Storm on the Horizon, the fourth Heavy Gear Storyline Book, is the newest instalment of the critically acclaimed Storyline series. It traces the cataclysmic events on the world of Terra Nova, the setting of Heavy Gear, through a collection of journals, articles and conversations. Storm on the Horizon also features a useful appendix with a full time-line of events, advice for Heavy Gear players and profiles of important characters.